Using the Amazon Redshift connection type, you can connect an Amazon Redshift database. Click Data Source button in the configuration panel to add a new data connection. Click CREATE NEW to launch a new connection from the connection type panel. Click Amazon Redshift connection button in the connection type panel. Set the server Name and port number where the Amazon Redshift service is running. 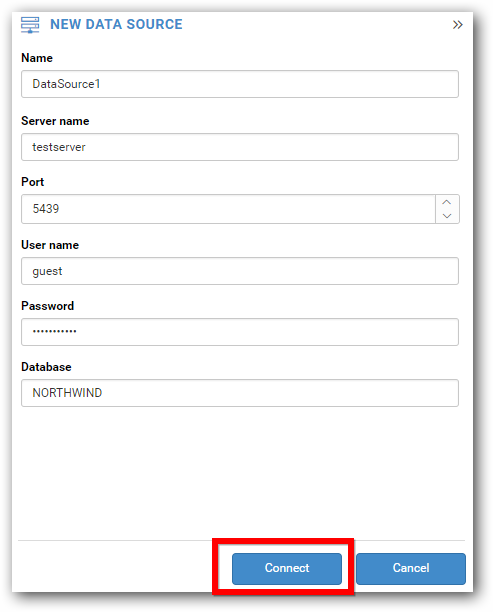 Enter the user name and password to connect to the Amazon Redshift. Enter the database name and click the Connect button to connect the Amazon Redshift. The selected database will be opened in the data design view window. Drag and drop the table from table list, and click Save button to save the data source with valid name.